In a world of many neopets, one stands out among the rest. Aubrey_Dawn, a Bruce made into a Poogle, stands as a beacon of hope to Neopians everywhere. Currently, she resides in Mystery Island with her siblings IceikaI and Brutus_Cassius. Her story is not unlike other neopets, but is an important one nonetheless. 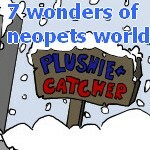 It all started years ago when her owner became a Neopian and saw the adorable dog-like creature that was a Poogle. It saddened her when she found it was limited edition and alas, she could not attain such a pet. Settling on a Tuskaninny, Aubrey_Dawn’s owner went about her way in Neopia trying to earn enough neopoints just to get by. Her owner never stopped thinking of the Poogle, though. She often searched through the pound, seeking to adopt a needy Poogle, or tried to get one on Poogle day, though was never able to be on on that day. So one day, Aubrey_Dawn’s owner set out on a mission. She would earn enough neopoints to buy a morphing potion. Some said it was crazy, others said it was genius, but one thing was clear. One way or another, a Poogle would be born. Games were played, deals were made and items were sold. Neopoint by slowly earned neopoint, the goal became more and more of a reality. Her owner was excited, nervous and overall proud the day that she finally started looking for trades that were within her budget. One kind Neopian gave her a good offer and accepted her hard earned neopoints. When the window opened up asking what she wanted to do with the morphing potion, Aubrey_Dawn’s owner swallowed hard. Her eyes took in the Bruce that would now become her desired Poogle. She carefully chose to use the morphing potion and clicked submit. In a flash, her Bruce was now a brightly colored purple Poogle, smiling back at her as if it knew all the hard work she had put into it. Currently, she is a bright starry color. It is a drastic change after having been colored snow. Aubrey_Dawn is now an avid reader, 262 books total. She greets others sweetly and overall, stays out of trouble. Every now and then she spins the wheel of misfortune and gets chickaroo. Still, she wanders around Neopia, taking part in various events and helping when she can. While never the valiant knight at the front lines, Aubrey_Dawn thrives as a contributor in Altador Cups and various battles that cross her path. So Aubrey_Dawn may not be the best in the Battledome or the biggest sports fan. She also may not be the smartest neopet, yet. One thing is for sure, though; she is a symbol to other neopet owners out in Neopia. With a dream, hard work and determination, even things that seem impossible can be achieved. Aubrey_Dawn's owner used many methods to try and earn neopoints to attain her goal. Really, time is key. 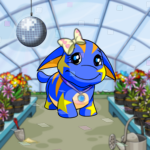 Whatever you do to earn neopoints, it will take days and days of doing that to attain enough neopoints to afford the morphing potion, lab ray or paintbrush you want. Here are some quick tips that other owners might find useful in their plight to attain the perfect neopet. First, playing games is the easiest and most common way to get neopoints. It is helpful to find a 100K a day guide and use that every day for your dailies as well as for all the games you play. When you find the games you excel at, specifically play those. If you can earn 3K from a few games a day, that's an easy 10-20K a day. Also, any other games that are fun, but maybe not as profitable, are still just as good. You may not earn as much from them, but you will be more likely to play them if they are games you enjoy. So you are earning neopoints from playing game after game after game. It is key to continue to put neopoints into your bank account. By accumulating interest every day, you are essentially getting free neopoints. It takes a while to earn a large amount of interest, but every bit helps on the way to your goal. Also, by having neopoints safely tucked away in your bank, they are safe from ice skeletons, ghosts and other naughty Neopian residents that might try to take your hard earned neopoints. Besides, the scary looking Skeith in the bank is actually quite nice. You're keeping food on his family's table by keeping him employed. Now, here's the trickier part. You can simply earn neopoints and save them away, but this might take a really long time, depending on your skill level at different games. Aubrey_Dawn's owner found putting items in her shop gave her a steady income that required relatively little work. By looking around on the trading post for good deals and reselling items in your shop, you can gain a small profit. Also, perusing through various shops, you can buy items that will go for a nice profit. The book store and bakery are good places to start when looking to buy and sell items. Often, the more expensive the item is in the shop, the more you can resell it for. Still, even small profits are profits. Key Quest is also a great way to get items to put into your shop. Often, each key has at least one negg or codestone, each worth several thousand neopoints. Lastly, a key thing that Aubrey_Dawn's owner did was find a good deal on the purple Poogle morphing potion. It is very important that you spend your hard earned neopoints wisely. The last thing you want is to spend all this time saving and have to use every last neopoint on your dream, leaving you with nothing. Whether you are looking for a lab ray to zap your way to the perfect paint, a morphing potion to instantly achieve your perfect pet or a paintbrush to finally paint your perfect pet the perfect color, you need to shop around. By posting on boards and looking around in different shops, the trading post and auctions, you can get a good feel for the going rate of the item you seek. Most Neopians are good about haggling. If someone is advertising on the boards or selling on the trading post, it might pay off to neomail them and see if you can get a good deal. Remember, though, they are probably trying for a dream pet as well, so be fair when offering. No one likes to lose neopoints. As mentioned from the start, Aubrey_Dawn's story is one that many neopets have. Dreams are being made every day in Neopia. Aubrey_Dawn should be a beacon nonetheless. By following the path of her owner, you too can achieve your dream. It’s not easy achieving your goal and it certainly takes time, but Aubrey_Dawn was created to prove, you can do it too.